You'll love the look of this beautiful cedar gate beside your house or as part of your yard's fence. Its functionality coupled with its unique styling makes it an addition to your home that you will treasure for years. Ornamental and practical, this 42-inch-wide wooden gate is decidedly different than many other gates and is easy to make. By using tongue and groove cedar boards, your privacy is ensured, as no one can peek through slits between the boards. 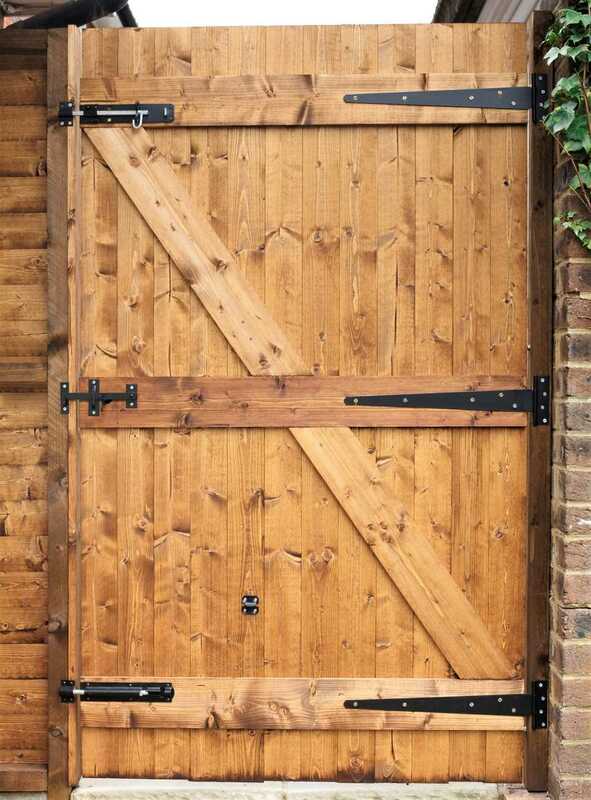 Its chunky, black wrought-iron-style strap hinges and its top-and-bottom slide bolts are ornamental touches that provide security as well as a striking contrast with the red cedar. Cross bracing strengthens the gate. Best of all, this cross bracing is easy to measure, cut, and attach. This guide describes how to build a 42-inch-wide gate. However, you can scale the gate width up or down according to your needs by adding more boards. As for height, many local building codes cap fence and gate height maximums at six feet. Be sure to check with your local permitting agency about heights and whether you need to obtain a fence building permit. With the miter saw, cut each of the tongue and groove boards to 72 inches long. With the measuring tape, measure out three 42-inch segments from the 6-inch-wide cedar board (the board that is not tongue and groove). Cut with your miter saw. On a level, flat surface such as a driveway or garage floor, lay out the three 6-inch-wide boards so that two of the boards are parallel to each other and are 5 feet apart. The third board should be parallel to the two other boards and exactly in the middle. Lay the cut tongue and groove boards on top of those three boards. Gently tap one board's tongue into the groove of its neighboring board until you have completed all of them. Working with the tongue and groove boards has likely disarranged the lower 6 inch-wide boards. So, keeping the tongue and groove boards in place, readjust those lower boards from the side so that they are back in the proper position. Nail the tongue and groove boards to the braces with the 3/8-inch galvanized nails. Keep a close eye on those lower boards so that they do not move out of position from your nailing. Carefully flip the gate over. Lay the remaining 6-inch-wide cedar board diagonally across the horizontal braces. Temporarily nail the diagonal board in place to secure it. Leave the nail heads exposed for easier removal. Lay the straight edge over the diagonal brace, staying parallel with the lines of the horizontal braces. Make six cut marks with the pencil parallel to the braces. Remove the two temporary nails. Cut the diagonal brace with the miter saw at those six marks. Three cut pieces will eventually be discarded (the two ends and the middle), leaving two cut pieces that you will use as the diagonal brace. Run a line of carpenter's glue on the back side of the two diagonal braces. Press the braces in place on the fence. Weigh down the two glued boards with cinder blocks, rocks, or anything sufficiently heavy. Let dry for about two hours. Flip the fence over. Nail the diagonal braces in place with the 3/8-inch nails. Set the gate in place in the doorway, supported by scrap cedar pieces to provide about 1/2 inch of clearance. Have an assistant hold the gate in place, leaving about 1/4 inch of distance on the hinge side of the door. Using the cordless drill and the hinges' included screws, screw the hinges in place at the top, middle, and bottom. Check to make sure that the gate swings properly. Adjust accordingly if needed. Using the cordless drill and the latches' included screws, screw the top and bottom slide (barrel) bolts in place on the gate. Screw their receiving sections on the door frame. Mount the flip latch in a fashion similar to the barrel bolt latches. Place the flip latch at the center, between the two barrel bolt latches.